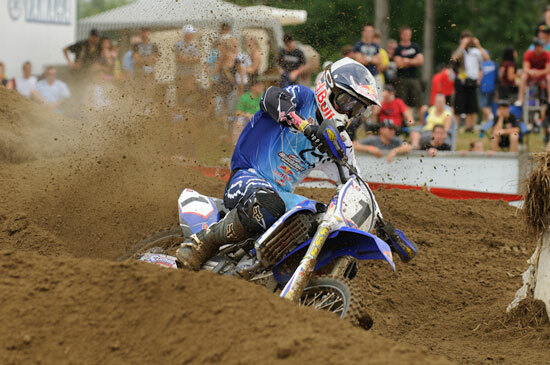 It was a stellar weekend for Yamaha Red Bull Blackfoot Fox Racing’s Colton Facciotti at Round 8 of the Canadian Motocross Nationals at Sand Del Lee MX Park in Richmond, Ontario on Sunday. 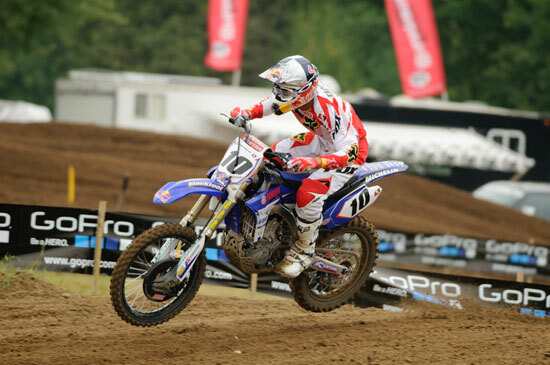 With his fifth clean sweep of the season, Facciotti not only decimated the competition he accumulated enough points in the title hunt to leave Richmond as the 2011 MX1 Champion. 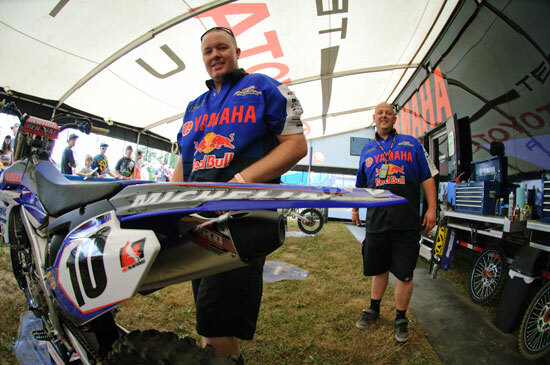 It is the third MX1 title for the Aldergrove, BC native, who now lives in St. Thomas, ON. He previously won the championship in 2008 and 2009. “I knew that I pretty well had the championship wrapped up but I wasn’t expecting to leave Sand Del Lee with the title. I thought that was going to have to wait until the last round, because Dusty wasn’t all that far behind me in the points. It would have been nice to do battle with him in both motos and finish our series-long rivalry for the title in Walton,” said Facciotti. 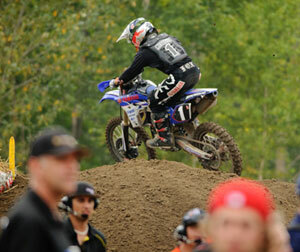 Some bad luck in the second moto for Dusty Klatt, saw Facciotti end the day with 51 more points than his MX1 teammate. 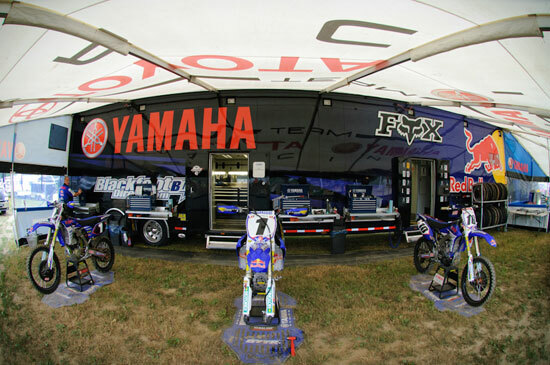 Campbell River, BC’s Klatt, who recorded 2-7 motos, has a 60 points advantage over third in the current rankings Teddy Maier, however, assuring the 2010 champ will make the MX1 title hunt a 1-2 punch for Team Yamaha Red Bull Blackfoot Fox Racing. In the MX2 class, Tyler Medaglia missed clinching the title on his home track by a handful of points due to unfavourable starts that saw him finish fourth overall on the strength of 5-3 motos. It was the first time this season that the defending champ was absent from the overall podium. “Things didn’t go my way today. Although my results were acceptable, I wasn’t racing for acceptable results. My aim was to claim the championship in front of hometown fans, friends and family. Maybe I put too much pressure on myself. 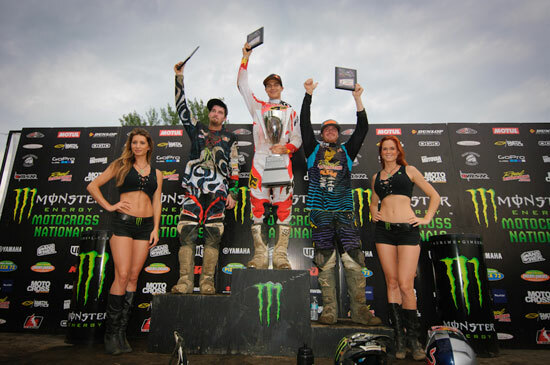 But with Jeremy [Medaglia] winning both motos, it was a great day for our family,” said Medaglia. With a 45 points advantage over second in the current rankings, Kaven Benoit, Medaglia only needs to pick up six points at the final round in Walton to secure the title. But only if Benoit records a clean sweep. In the first MX1 moto at a hot, humid and rainy Sand Del Lee, Klatt and Facciotti got a top five start behind Teddy Maier, who snared the holeshot. Maier’s up front position didn’t last more than a few laps. Facciotti put his powerful YZ 450F in overdrive to stick a pass on the former MX2 champ. Once in control at the front of the pack, Facciotti put on a clinic that had him build a lead of 20 seconds before the midway point of the moto. Behind a checked-out Facciotti, Klatt was engaged in a dogfight with Maier, Kyle Keast and Shawn Maffenbeier in a bid to work his way into second place. It took about half the moto for Klatt to clear the task. Once he was in second place, Klatt kept charging hard to reel in Facciotti but when the checkered flag was waved, he still looked at a 15 seconds deficit between himself and his teammate. Facciotti shot out of the gate at the start of the second moto like a missile, hammering down the holeshot and then lead wire to wire. Close behind Facciotti going into turn one were Klatt, Maier, Maffenbeier, Keast and Matt Goerke. 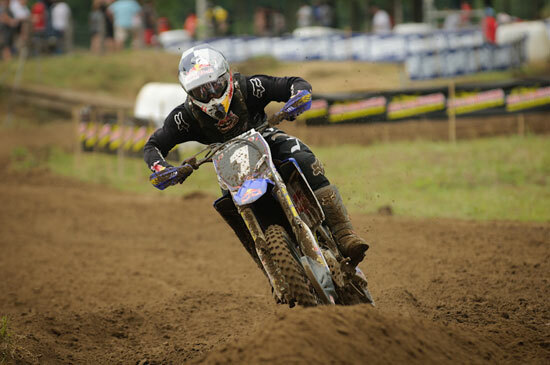 As in the first moto, Facciotti ran his own race leaving the rest of the field to fend for themselves. Making it all look embarrassingly easy, he arrived at the finish line 18 seconds ahead of second place Goerke. Although Klatt had been in command of second place while third place Maier fought off Maffenbeier and Goerke, Maier caved to Goerke’s pressure and the race would soon be on for second place. Once Goerke caught up to Klatt, the American and Canadian became embroiled in an epic bar-banging battle that saw them connect and go down in a heap. Goerke managed to get back into action unscathed but it took a while for Klatt to rejoin the fray just inside the top 10. By the end of the race Klatt had managed to make up three places. On the strength of 2-7 motos, however, he sealed the top five overall with a noteworthy fifth on the day. “I got good starts in both motos but it definitely was no cakewalk out there today. The first moto went well enough but the second one turned into a disaster after going down with Goerke. We were really going at it and next thing I know we’re both on the ground,” said Klatt. In MX2 action, Jeremy Medaglia, younger brother of Tyler, claimed the first moto holeshot. Except for Tyler Medaglia, all the key players in the championship dove into turn one in the top five behind Jeremy Medaglia. A second turn pileup claimed Tyler Medaglia among its victims. Not for the first time this season he was resigned to a back of the pack remount. Putting on a blistering charge on his potent YZ 250F, Medaglia picked off rider after rider to eventually claim fifth place at the finish line. 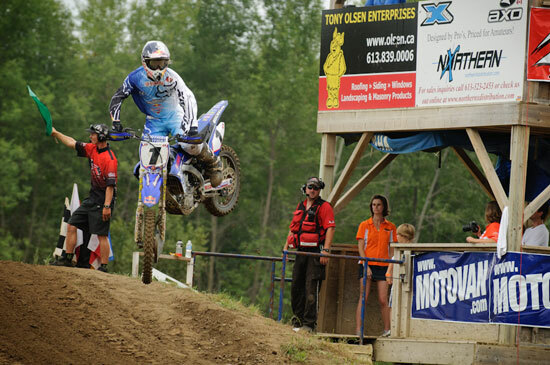 Kaven Benoit grabbed the second moto holeshot and led the pack until the halfway point when Jeremy Medaglia took over. Tyler Medaglia, who started around 10th place, clawed his way into the top five but from there on it was tough going with Tyler Sjoberg, Austin Politelli and Benoit between himself and his brother. A slugfest ensued with Medaglia and the American teammates Sjoberg and Politelli, which saw Politelli go down for a soil sample and Sjoberg finally cave in to Medaglia’s unrelenting pressure. With time running out, Medaglia was unable to challenge Benoit for second place, settling for third at the finish line and fourth overall on the day. After a two-week break in the schedule the final round of the championship tour will take place in Walton, Ontario on Sunday, August 21. You can find us at our newly updated website www.blackfootracing.com and link to all the team's premiere sponsors who have partnered with Blackfoot Racing’s Championship effort.